Finally, I went to a panto (short for “pantomime” which nobody ever ever says anymore). Like Bonfire Night, this has been on my list for ages. And like Bonfire Night, it took the arrival of the Intrepid Raul to spur me on. I mean who wants to go to a panto alone? That's just sad. Up to now, when I told friends in the UK that I’d never been to a panto they were mostly astonished. I guess for them it’s such a part of the fabric of growing up it’s impossible to believe someone could reach adulthood without having experienced the phenomenon. A bit like a Canadian never having seen “Hockey Night in Canada” or got their tongue stuck to a frozen tetherball pole. For those non-UK readers for whom the term "pantomime" conjures images of Marcel Marceau, here’s how Wikipedia describes things, summing it up so well I’m not even going to try to paraphrase, which is what I usually do. 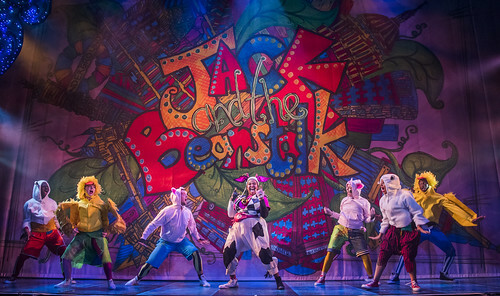 I saw “Jack and the Beanstalk” at the Lyric Hammersmith (running until January 6th so it’s not too late, Londoners!). My “Jack and the Beanstalk” was naturally set in London, where Jack and her (Wait... her? More on that later) mother are forced to sell the family cow because their rent is spiralling out of control. It doesn’t take a PhD in sociology to see the topicality in that little detail. The script was also littered with references to Hammersmith, and gentrification, and to the general lack of vegetables in the modern diet, among other things. And why is the rent so high? Because they live in Hammersmith! Also, their landlord is a textbook villain, the next Law of Panto. Panto baddies are really really bad, requiring the audience to hiss and boo loudly at them. The Lyric’s baddie this year was Squire Fleshcreep (truly excellent name) played with occasional corpsing* by a woman, Vikki Stone. The real estate mogul Fleshcreep bore a none-too-subtle resemblance to a certain US politician, especially with her moulded orange bouffant wig. 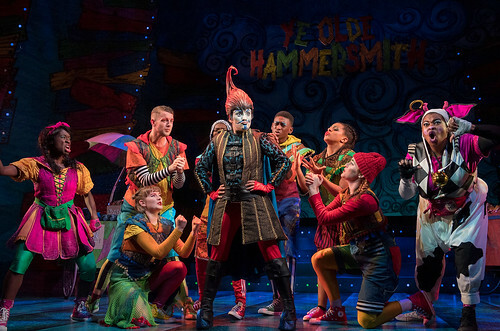 Traditionally there’s a lot of cross-gender casting in panto. The hero boy is usually played by a woman (in the style of “Peter Pan”) but the Lyric this year pushed things further. I’ve already mentioned the baddie was played by a woman, but in this production the hero Jack was not just played by a woman (Faith Omole) but was written as female. And Jill, Jack’s love interest, was male. And of course there was the Dame, the next piece of the puzzle. 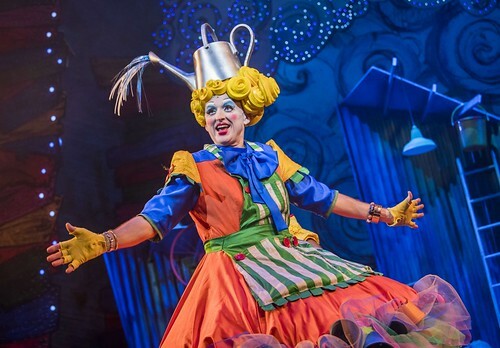 Every self-respecting panto needs a Dame - a role for an older woman who’s usually the mother of the hero. And almost always, the Dame is played by a man in drag. (Think Lady Bracknell on steroids in a much sillier costume.) It’s a long and proud tradition. Besides taking a role in the narrative the Dame for “Jack and Beanstalk” also did a bit of stand up comedy, sang and danced several musical numbers, tossed candies into the audience, and read out birthday wishes and random greetings to people in the audience (a bit like having your name on the scoreboard at a hockey game). 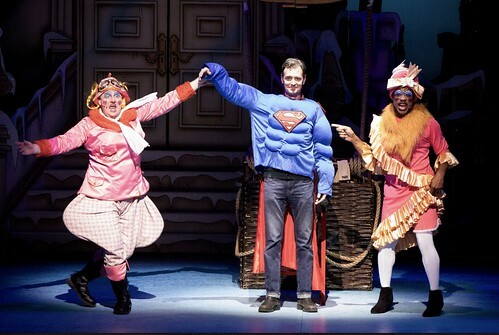 In case you haven’t twigged to it yet, the fourth wall is utterly non-existent in panto. Kraig Thornber as Dame Lotte, who had more costume changes than Madonna. The Dame is also often takes the lead in another critical element. 6.1a: A character will be accused of something and cry out “Oh no I didn’t!” (Or, alternately in the third person: “Oh no he/she didn’t”) and the audience responds with “Oh yes you did!” And the character says “Oh no I didn’t!” And the audience comes back with… well, you get the idea. 6.1b: The second shout-out is wrapped up another essential element, the Ghost Chase (6.1b.i), wherein characters are stalked by a ghost/villain/random miscreant who lurks out of sight while the the audience shout themselves hoarse screaming, “He’s behind you!” only for the lurker to disappear just before the character turns around. Naturally, this sequence gets repeated many times. “He’s behind you!” is part of the cultural fabric of the country, like “Only Fools and Horses” or complaining about the trains. 6b: Singing: Besides songs performed by the cast, there is traditionally a front-cloth sing-along wherein the audience is divided into two halves and exhorted to out-sing the opposing side. This year at the Lyric we did “Ain’t no mountain high enough". 6c: Being dragged up on stage: The ultimate in audience participation is being plucked out of your seat to become part of the action. Again, the Dame is often involved in this, singling out a make audience member for special attention and referring back to him throughout the evening, culminating in having him hauled up on stage, dressed in a silly costume, and made to perform some sort of action. (There’s a good Guardian piece here from the point of view of the hapless victim.) At the Lyric, in addition the to adult victim, they also brought a little girl up on stage who got to chop down the beanstalk! I’ve already mentioned the sing-a-long, but we got a lot more music in “Jack and the Beanstalk”. And in true panto fashion, a lot of it was filched from current popular music charts with adapted lyrics, many of which featured another panto staple. And of course along with the puns comes the physical equivalent - slapstick. 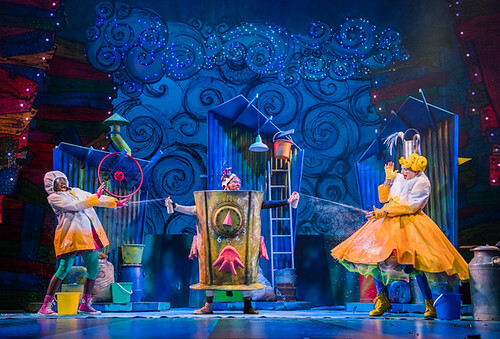 The Milking Scene from “Jack and the Beanstalk” - a very credible variation in the form. Clearly they’ve done this before, because they spread a tarp on the stage and put on protective clothing in preparation. And there you have it - the Ten Commandments of Panto. A truly great fun, silly, frantic, loud, crazy traditional holiday treat. I had a fantastic time at “Jack and the Beanstalk” and will definitely be going back next year for whatever is on the cards. Making certain, of course, to get tickets safely tucked in the back of the stalls, or possibly the 7th balcony, well out of the audience participation zone. Back when I bought it, the boat was not exactly the slickest looking thing on the canal. Astute Go Stay Work Play Live readers will remember the outside was a nasty shade of worn out green. And they’ll also remember the exciting moment when I got home from the first Azerbaijan gig to the freshly painted boat and later when I had the sign writing done. That was the first step. Then I went on to tackle some of the more egregious interior fittings, eventually getting to a point where things were in all cases functional and in some cases even sort of normal-looking. And here's what the living area looked like on the day I bought the boat, and what it looked like a few coats of paint and several years later. All of these were relatively simple upgrades. Paint does wonders, and replacing the Unabomber style rough-edged wooden shelving in the kitchen with clean white timber was easy and had a lot of impact. But there were still a few things that I knew were going to be a much much bigger job. The kitchen area is better than it was, but still, those open shelves and rough drawers were just not up to scratch. And the floor. Ah... the floor. It was a mottled mish-mash of very worn cork tile glued over wood-effect vinyl glued over the plywood subfloor. Mostly. Some areas had no cork. Some had no vinyl either. 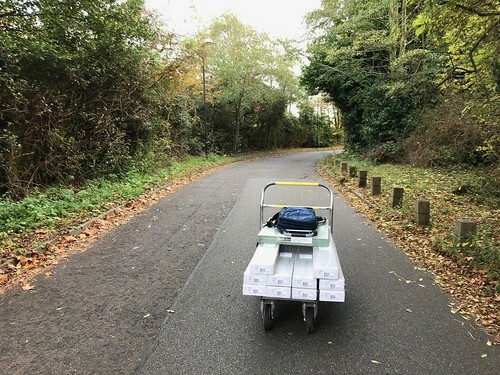 And there were a number of worryingly squishy soft spots that I’d simply covered with patches of plywood reasoning that I’d fix when I dealt with the floor in general. 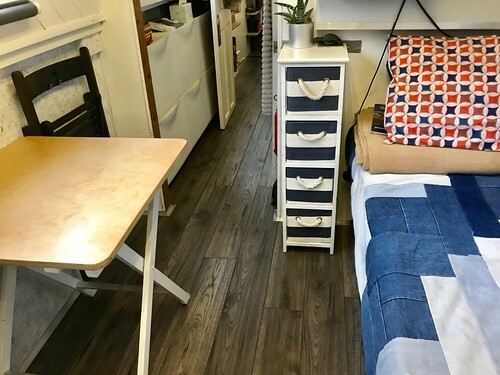 Because no number of trips to IKEA or coats of paint were going to make that floor anything that I wanted to continue to live with. As I said, I've been planning this for a while. I estimated things would take about a month and resolved to simply settle in at my far-flung mooring for the duration. There are some significant advantages to the mooring. First, I can plug into mains power, which is critical even if you only consider the amount of vacuuming I had to do. Second, there’s a B&Q just down the road (for Canadian readers, substitute Home Depot for B&Q). There’s also a large Tesco nearby so I could easily keep myself fed. (I had lunch most days in the Tesco Café where they do a pretty credible tuna mayonnaise jacket potato and nice raspberry brownies). The marina is also an easy place to receive deliveries. 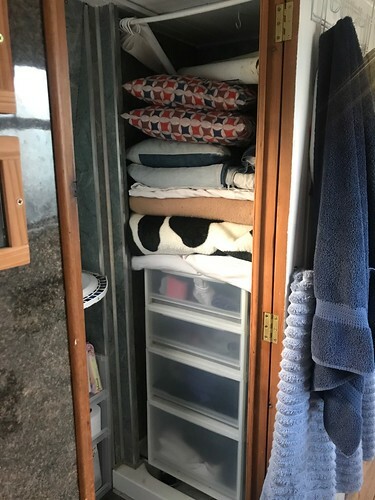 In fact, I got quite adept at driving the boat backwards from my berth to the slipway near the carpark making it relatively simple to get large amounts of stuff on and off the boat. Like this! Here’s the lovely men from the stage company loading up the ridiculously small amount of worldly goods I sent away to give myself a bit of working space. I probably could have managed with a slightly smaller storage pod. The marina also has one significant disadvantage: it is so poorly located for transport that I have to allocate about 90 minutes to get anywhere more exciting than Acton. 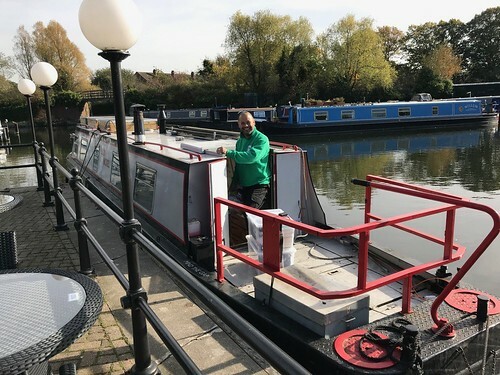 Even though I’ve moored at places that are geographically much further from central London, the particular corner of the world where my marina is happens to fall inconveniently far from any tube or rail station and is served by a single circuitous bus route that seems to spend most of its time stuck in traffic. The cursed Route E6 doesn’t even have the self-respect to use double-decker buses, which is a dead giveaway that you're not exactly at Piccadilly Circus. I reasoned that the difficulty of escaping the area would simply concentrate my efforts to finish up and be free. So it began. With extraneous materials removed, I dismantled the old bed frame and the bedroom officially became the workshop. And what does any self-respecting workshop need? A good power saw of course! The workshop. Check out that saw! It’s a chop saw that is also a table saw! Bloody brilliant. I’m very very very happy with this device. I even built the new bed frame so that the saw fits exactly underneath it. I love this saw. But it did make a LOT of sawdust, hence all the vacuuming. First on the list was re-building the front step to turn it into a much larger, more stable and more accessible storage area, and next was a new bed frame that hinges up for easier access to the storage underneath. Then it was on to the floor! 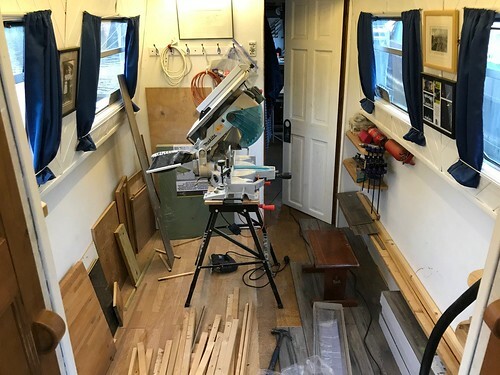 I decided to use the same engineered laminate flooring through the whole boat, though not the posh kind that’s got a layer of real wood on the top. Mine has a very attractive picture of wood on it, and some fake embossed texture to add to the illusion. It’s nicer than it sounds, really. What was NOT nice was getting 150kg of laminate flooring from B&Q onto the boat. This photo was taken part way down the long road between B&Q and the marina, with me hauling that cart every inch of the way. Then I carried each of those surprisingly heavy packs to the very very end of the pier to my berth and then stacking them in the boat. And then I trudged the empty cart back to B&Q. Tough day. I repeated this process for other materials too. It was kind of not fun. 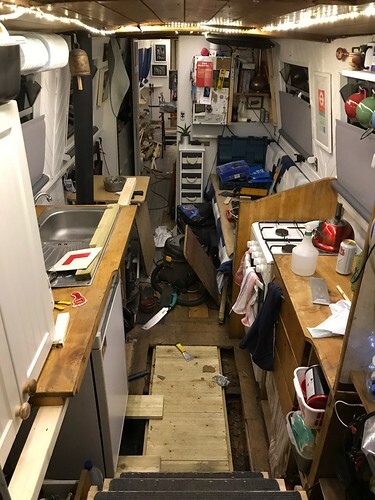 There was only one room in the boat that was relatively free from building detritus - the bathroom. 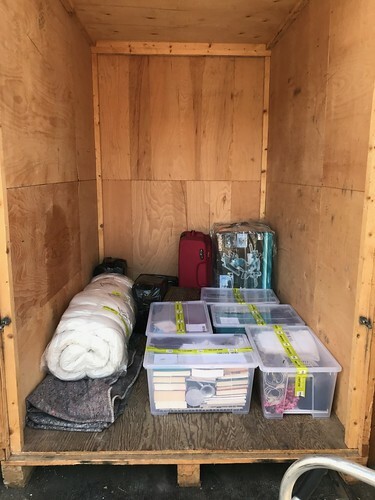 Every morning I had to dismantle the temporary bed (three couch cushions, three blankets, two pillows and a spare sleeping bag for extra insulation), and stack all the bedding on top of the bedroom drawers that lived for a month in the shower stall. Couch cushions went in front of this and then shelves and folding chair and whatever else was in the way. It took me about an hour every night to get all the tools stowed, exile the debris to ever-growing piles on the pier outside the boat, and vacuum and vacuum and vacuum some more. Then I could open up the bathroom and rebuild the bed and then, finally, think about making some supper. I did get into a bit of a rhythm but really, it’s not an ideal way of working. It was, however, very very cheap. No added living costs and no commute time to get from bed to workshop! I feel like I’m getting things out of order here, but that’s kind of how it happened. I started the floor and got it laid through the bedroom, bathroom and hallway before I had to start dismantling kitchen cabinets in order to get the new flooring into that area. 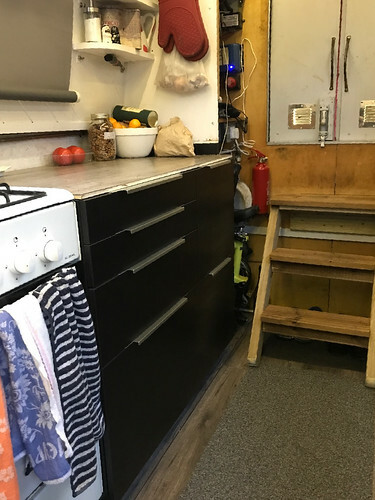 Plus, because both the stove and the fridge have flexible gas connections, I was keen not to have to disconnect them because that would mean getting a certified gas engineer in to re-connect them. Instead I carefully shifted them from side to side, accessing tiny areas of floor then shifting again for the next tiny area. There were times when the only way to get from the work area to the rest of the boat was to climb over the stove. And then it all went a bit wrong. 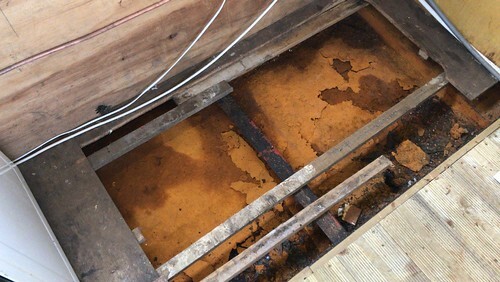 Astute Go Stay Work Play Live readers may recall me mentioning worryingly squishy bits of floor in the kitchen, which I cleverly ignored for a few years by laying some plywood and pretending it was all fine. Now though, it was time to see what was really happening under there. And it was not pretty. Oh no. Not at all. This is what was underneath. Rust so thick it made me feel a bit sick. So I got stuck in. Scraping out all the loose stuff with a putty knife (there was lots and lots) and then vacuuming and scraping more and then brushing it all with a rust inhibitor which had to dry for two days. Then painting to protect the steel that’s left. And then the whole subfloor had to be replaced. The area pictured above is less than a third of the area that needed this treatment. Bearing in mind the whole thing preceded like this: shift the fridge/stove two feet, cut out old flooring, scrape out rust, vacuum, treat for rust, allow to dry, cover with new subfloor, shift fridge/stove onto new subfloor, repeat for area recently covered by fridge/stove, etc…Then repeat for the painting, then add 50mm thick styrofoam insulation panels and then permanently fix down the new floor, then, and only then, actually finish laying the new laminate flooring. And this! All my grubby coal and kindling is neatly corralled in a drawer under the sink. And the front panel of the fridge turns out to be a much more interesting colour on its back side. 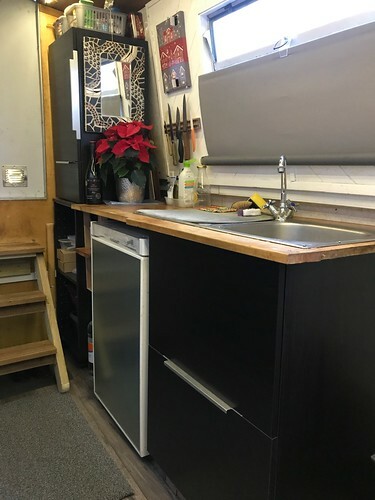 And I’ve got a proper upper cabinet, and more counter space, and room for a handmade-long-packed-away mirror and a poinsettia and an Advent calendar! And the floor. Oh the floor. What a difference. Of course there's more to do. The kitchen countertops. A few more drawers. One narrow cabinet. A new system for the recycling. And the sink in the bathroom. And the floorboards all need to be secured better. And the fireplace surround needs serious attention and and and and… But I decided after a long month of hard work and dust and Tesco jacket potatoes I deserved to enjoy my new space and relax a bit before the Christmas Holidays. So cleaned everything up, and organised things in my lovely new cabinets and called some men to haul away the mounds of rusty rubbish and aimed my boat back at central London where I’m now whiling away a couple of weeks with Christmas shopping and stoking the fire and having people over to ooh and aah over my lovely new home. And, most importantly, not vacuuming for two hours a day.